One of the great things about camping is that it's easy to take your dog along. Camping with your canine companion can be a lot of fun, but it's definitely important to take precautions to help ensure your pet stays safe and comfortable throughout the trip. 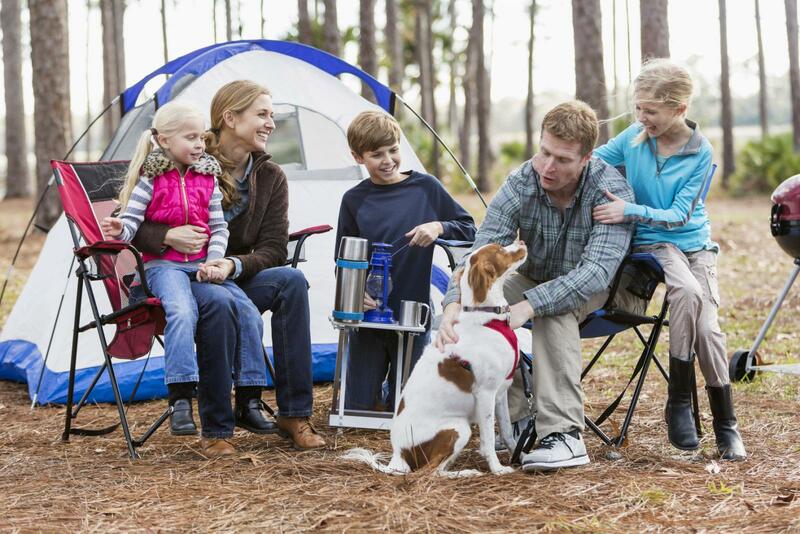 The American Animal Hospital Association (AAHA) recommends introducing your dog to your camping gear at home so he can get accustomed to it in familiar surroundings. Consider setting up your tent and letting your dog sniff around it and spend some time in it with you. Also take evening walks using a flashlight or headlamp - whatever form of lighting you're likely to use at the campground. This will make it easier for your dog to adjust to camping, which is important for his comfort. Make sure your dog's vaccinations are up-to-date and put him on a prescription flea and tick prevention program before the camping trip. You never know what your dog might be exposed to in campgrounds, dog parks, rest areas, and hiking trails. It's best to take all precautions when it comes to protecting your pet before a camping trip. Grab a copy of his veterinary records to take with you in case you need them at the campground or have to visit an out-of-town vet during the trip. Make sure your dog has a right-sized collar. Dog collars that are too loose can easily slip off if the animal starts tugging on his leash or tie out, or if the collar gets snagged on underbrush when hiking. Adjustable collars often become looser with time and activity, so consider investing in one that is sized correctly for your pet without needing to be adjusted. There is always a risk that you could get separated from your dog on a camping trip. So, it's essential to make it incredibly easy for anyone who may find your dog to locate you. Microchip your dog and attach an easily legible identification tag with your pet's name and your contact information to his collar, along with his rabies tag (which can be traced to you through your veterinarian). Use your cell number since you'll have it with you. If your dog has an outdated or illegible tag or if the microchip registry has old contact information, get them updated before going camping. As iHeartDogs points out, access to plenty of drinking water for your pet is critical, for both the car ride and after arriving at your destination. The fact you're going to be camping in the great outdoors does not mean clean water will be readily available. Not all creeks, streams, and other water supplies are safe for drinking, so factor in your dog when deciding how much bottled or purified water you'll need during the trip. Be sure to carry along a container appropriate for your dog to drink from and keep it handy at all times. Keep his water bowl full at the campground and stop for regular water breaks otherwise. When a human sets out on a camping trip, he or she is prepared to rough it for a few days. However, dogs can't mentally prepare for this, so you'll need to prepare a spot for your pet to nest comfortably inside the tent or RV. If your dog usually sleeps in a crate, bring it with you (unless you're going backpacking). If practical, bring your dog's bed from home. If not, use towels, a comforter, a pillow or blankets from home (so the scent is familiar) to create a sleeping space for your dog. Allow your dog to stretch out on the same items in the car so a sense of ownership develops. This will help your dog rest easy and (hopefully!) keep him out of your sleeping bag. You're probably planning to pack a pair of hiking boots or trail shoes for yourself to wear during your camping trip. According to iHeartDogs, it's important to show the same consideration for your dog. Your pet likely isn't accustomed to walking on the types of surfaces encountered during typical camping trips. With that in mind, consider bringing along doggie booties to help protect your pet's tootsies when you're hiking over uneven terrain or walking on extremely hot or cold ground. You wouldn't set out on a camping trip without a first aid kit filled with supplies appropriate for you and your family. As pointed out on CampTrip.com, it's also important to have the same type of supply kit on hand for your dog. You can put together your own kit or purchase one made just for dogs. Whether you're in a campground or the backcountry and you're out and about enjoying adventures, rules regarding pets will apply. Those rules are for your dog's protection, as well as your safety and that of other guests and the wild animals who may live in the area. Failing to follow safety precaution can put your beloved pet in harm's way unnecessarily and turn a wonderful outing into a tragic occasion. It's not worth the risk to break the rules. 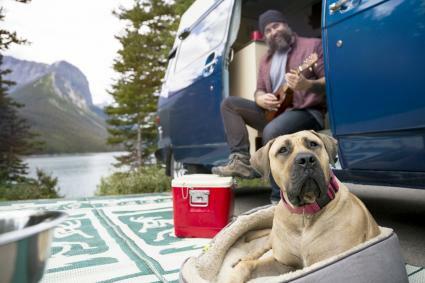 By planning ahead and making plans for your trip with safety in mind, you can help ensure that your dog has a positive experience on your next camping adventure. Have fun, stay safe, pack wisely, and enjoy exploring the great outdoors with your canine companion!